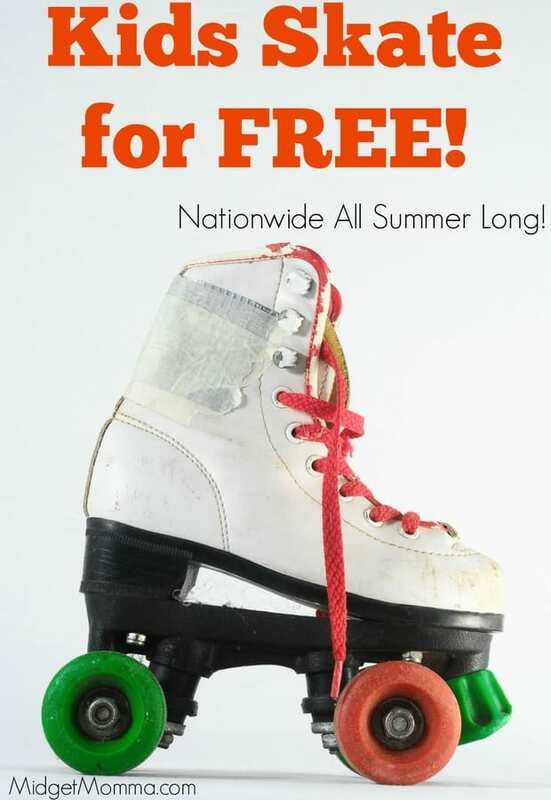 Kids Skate FREE All Summer Long! Looking for something fun to do with the kids? Did you know that the kids skate FREE All summer long? !?! They can and it is super easy to get the kids signed up and ready to have fun with the FREE Skating All Summer long! I would suggest buying a pair of skates for your kids, (you can get them fairly cheap on Amazon) instead of renting them each week. It is SUPER Easy to get all set up with the FREE Skating for the kids for the whole summer. Just head on over here enter your zip code to find a rink near you. Then click on the green “Register for This Skating Center” banner. Once you have filled out the form, you will receive an email asking you to verify your email address. Once you have done that you will a registered member of Kids Skate Free. Please keep in mind your first set of passes will not be ready until Sunday of that week. You can also take the kids to the 2018 Regal Cinemas Summer Movies – Where movies are just $1 per person! Plus don’t forget to check out our list of FREE Summer Activities for Kids, for even more FREE summer fun! And don’t forget to have some fun with the 2018 FREE Ice Cream Days! Lots of place give FREE ice cream at random times through out the year, and we keep that list updated for you. You will also probably love this Summer Rules List Printable – it is a great way to help keep the kids from spending to much time on electronic devices. If your kids love slime, then make sure you check out this post on how to make slime without borax. If you are looking for discounts on local things to do with the kids that are budget friendly check out Groupon and LivingSocial, where you can score deep discounts on family activities. If you are looking for awesome deals all the time, family fun and more make sure you join our facebook group here ? If you are looking for tasty recipes that are perfect for family meals head on over here and join our facebook page to get new recipes each day! Have a Harkins Theater near you? Check out the Harkins Movies Summer Movies! You can see movies for less then $1! Want to get crafty? Make some homemade playdough! What a disappointment!! Nationwide? Oregon didn’t even make the list. Aside from Oaks park, are there any skating rink in Oregon?